App for Finding Machine Tool Service Providers Modern Machine Shop 75 address them. The recently introduced app can be found in both Apple's app store and Google Play, and a desktop PC version is also available. "We are like Uber for machine tool service, but with a difference," Mr. Vinod says. "The differ- ence is, we are not bringing new providers into the market. We are going to established providers and making them visible to machine shops." The app focuses on independent, third-party service providers, he says. During its initial launch period, coverage was limited to Ohio, Indiana and Kentucky, and that head start means participation is still best in these states. More than 70 inde- pendent service companies within these states have registered with the app, all of which are available to offer bids on machine tool service within the geographic reaches they cover. The app has just recently gone national, so service providers from around the country have now begun to join as well. 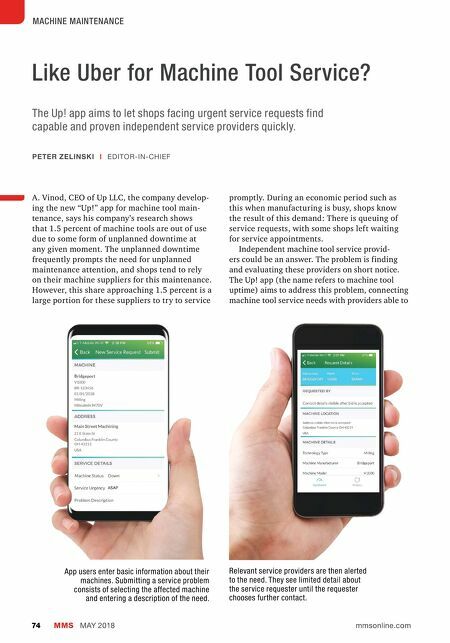 Service requesters—that is, machine shops— use the app by entering their machine tools by OEM and model number. When one of these machines needs service, the user can then enter a description of the need. Service providers knowledgeable about that machine type can reply through the app to offer a quoted price and date of service. Information available about every service provider responding this way includes whether the company has liability insurance, whether it has worker's compensation insurance and the provider's rating (out of five stars) based on other app users' feedback. The machine shop also sees contact information, enabling it to engage the service provider directly to work out details before the offer is accepted. The app is free for all parties to use, and its developers do not take a sales commission. The app's creators expect to earn revenue from it through sponsorships. "Right now, our biggest obstacle to adoption is the loyalty manufacturers have to their current service providers," Mr. Vinod says. With good reason, shops prefer to stick with the machine tool suppliers. The challenge for these shops, and the opportunity for other service providers, comes when the need is urgent. "That's why I don't expect that price will be the driver that wins most bids," he says. "I think the bids in our app will be won largely on availability." | Up LLC | 614-333-0365 | theupapp.com An example of an independent machine tool service provider now reachable through the app, Bob Baum of Cycle Start CNC Machine Service is seen here checking the alignment after relocating a vertical turning center. DRAWING ATTENTION One potential downtime source: a drawbar in decline. Check out gbm.media/drawbar .